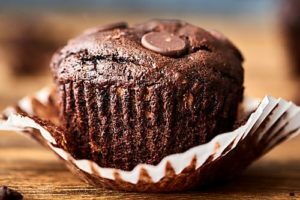 Breakfast muffins are a favorite of mine, especially if they involve chocolate. I especially love this recipe for Chocolate Banana Muffins and hope you enjoy them too! These muffins are so quick to make and bake that they can be made on school mornings. Preheat oven to 425 degrees. Put paper liners in a 12 muffin tin, lightly spray with cooking spray and set aside. Place all of the ingredients in a blender, except chocolate chips, and pulse until blended well. Fold in chocolate chips. Scoop 1/4 cup batter into each muffin cup. Bake in preheated oven for 5 minutes then lower oven temperature to 350 degrees, bake 5 minutes longer. Best served warm! *I like to add a tablespoon or two of ground flaxseed meal to mine batter. **If you don’t have oat flour just add 2 cups old fashioned oats into a food processor and pulse until it resembles flour.